I already mentioned that sleep was my biggest challenge when our son was a baby. If we were BFFs, this is what I would tell you about a baby's sleep in the first year. The saying "Sleep when your baby sleeps" is still true. As science and technology advance, many aspects of the world today change at lightning speed and sometimes age-old advice is not always applicable anymore. That is not the case with this well-known gem. So leave the laundry, turn off your phone and take a nap. Sleep deprivation may lead to severe nausea. While the doctors at the hospital really could not explain the extremely severe nausea that I encountered about 36 hours after S was born, I'm convinced it had to do with the lack of sleep on top of giving birth. It took nearly a full day to get under control and then came back again a few days later. They gave me some pretty strong anti-nausea medications, and they didn't work. The only thing that really helped was getting some sleep. Top up your baby before bed. Even if you are feeding more on a schedule than entirely on demand, top up your baby with a feed before bed. Newborns shouldn't sleep with a nightlight. A public health nurse told us about this shortly after S was born. Babies are not developmentally able to be afraid of the dark, and using a nightlight with a newborn can be damaging to their eye development. We were told on a darkness scale of 1-5, a baby's room should be about a 4. Make a "going to sleep routine" and stick with it. One day (of many) when I had called my mother in tears because I just couldn't get S to nap I remember she said to me, "You're doing too many things to try and get him to sleep. Pick 3 or 4 things you do with him before nap and bed. Do them each time, and he will learn the routine." Since then we have some milk, read a few stories, sing 2 songs, cuddle, and he goes into the crib. It took some time, but he did learn the routine, and it works. Rob discovered the magic of white noise a few weeks after S was born, and then we downloaded our favourite white noise app. Genius. Sleep training a baby does not mean he will start sleeping through the night. I have no idea who put this ridiculous idea into my head, but I thought once we sleep trained S (we used the Ferber method), that he would start sleeping through the night. Nope. While he needed much less of the sleepytime-baby-rocking-dance to fall alseep, he still woke a couple times in the night for a good few months. Sleep training a baby involves sleep training yourself as well. It may be awhile before you get a full night's sleep again. My husband and I experienced levels of exhaustion we didn't know existed. I'd get angry because I was tired. Our bedtime moved from 11pm to 8:00pm. Lots of changes happen but, you're a team, and you can work through all of the changes together. It's ok to talk to your mommy friends about their baby's sleep....a little. I found it helpful to have a close mommy friend who's baby was just days older than mine. We were (and still are) able to check in and see if we are facing the same challenges. This can be so reassuring. Just be careful not to compare too much and create new expectations for your baby. Too often, I found myself assuming S should be sleeping a certain way because someone else's baby was or because the book said so. He is his own little man, growing his way. After 5 months of really struggling, I saw a psychiatrist who asked me this question, "How many hours of sleep do you get a night in a row?" My answer was about 3 or 4. She told me that I had to figure out how to get 6 hours of sleep in a row at night. Restorative sleep happens at 6 hours in a row. So we put some strategies into place to make that happen for at least a week, and it made a difference. Before having a baby, I had completely underestimated what it would be like to not have family in the city to help us. Were our families supportive? Yup. Did they want to help? Absolutely. Were they a 5 or 10 minute drive away on a bad day? No. But we asked for help anyways. Even if it was more inconvenient for them and a longer wait time for us until they arrived, asking for help from our families, friends, and doctors always got us back on track. Also, feel free to contact a sleep coach. I waited way too long to do this with Seb. Catherine, from Motherhand, helped us put a plan into place when S was a toddler and having a hard time sleeping without us in the room. She also specializes in infant sleep coaching. Having a baby is awesome. I am not strong enough of a writer to express just how amazing I feel when he brings me a book to read, or when I hear him laugh, or when I see him sleeping peacefully under his favourite quilt. It is the most incredible thing I have ever done. It is also the hardest thing I have ever done. On the days that it is hard, I promise, it gets better. And then after that, it gets even better. 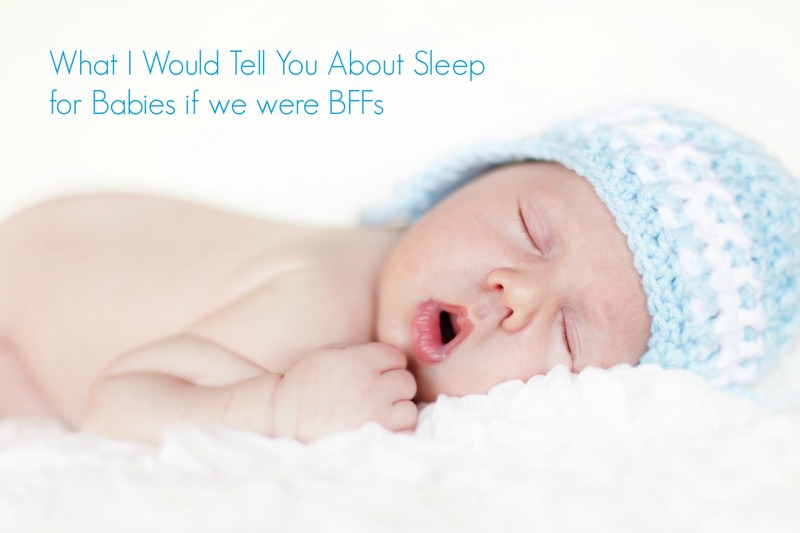 Anything else you'd share about baby sleep with your BFFs? Please keep in mind that I am not a medical professional. These are just bits of advice I'm sharing based on my experiences. If you have any questions about your little one, please check with your family doctor. I'm sure they will be happy to help and understand if you are feeling overwhelmed.